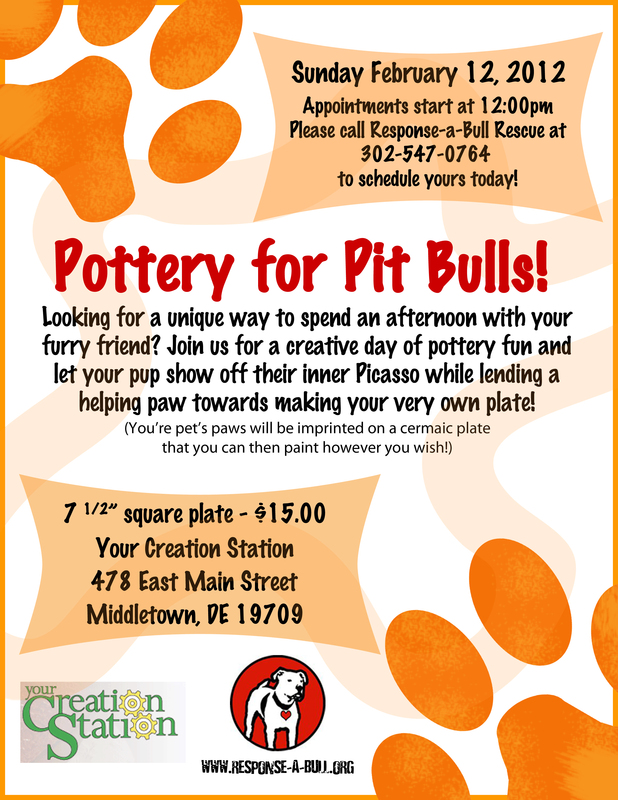 Your Creation Station is hosting a fundraiser for the Response-A-Bull Rescue on February 12. We’ll be making Paw Plates on our 7″ coupe salad plate with proceeds going to the rescue. The Response-a-Bull Rescue is a non-profit organization located in Delaware devoted to the Pit Bulls and Bully Breeds who are so greatly misunderstood. Thier mission is to rescue, educate and promote responsible ownership. They envision a society with compassion and kindness toward all loving companions without negative stereotypes and senseless laws of breed discrimination. Although we won’t turn you away without one, and reservations are not required at Your Creation Station, we are asking that you call the rescue to set up a time to bring your pet in. This will help us get a better idea of how many people to expect as well as make the whole day go smoother. Please call Response-a-Bull Rescue at 302-547-0764 to schedule your spot. Thanks!